Gazing for the solution to open a password protected Access Database? Use SysTools Access Password Recovery Tool to decrypts multilingual & complex password from protected MDB file within few clicks. It allows to remove or reset .mdb file password without any hassle and also retrieve Password from MDA & MDW files. 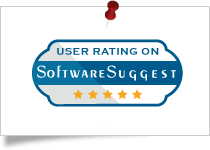 The SysTools Access Password Recovery Toolrated with 5 stars for removing security from mdb file and letting user to access secured MDB file without affecting its originality. 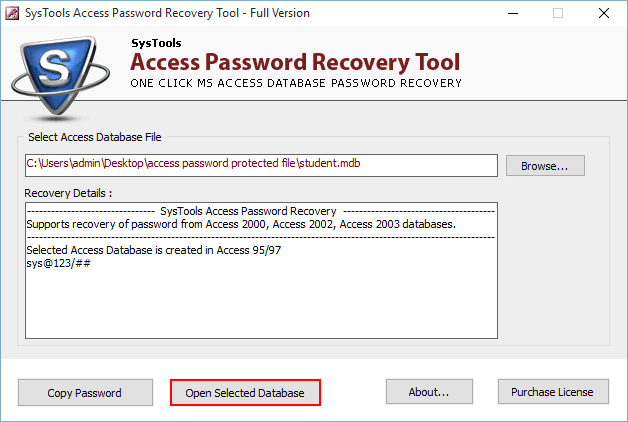 Software Suggest states that SysTools MDB Password Recovery is the best tool to bypass MS Access Database Security restrictions and recover forgotten MDB file password without harming the original content. 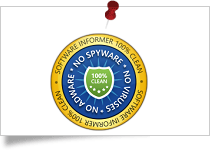 Access password recovery crack software by SysTools scored 4 star rating from 'Software Informer' for unlocking MDB file password and being virus/spyware free tool. MS Access database password recovery tool is an effective solution to decrypt alphanumeric password of MDB file. This software is magical and its performance speed is amazing. Using this we can unlock the password protected MDB file within a few minutes. All in all, I found this as a splendid approach to perform recovery of a forgotten password from Access Database in comparison to others. After deep research on Access password Recovery Tool, I can say this is one of the secure way to open protected Access MDB database. This tool involves enriched features, which helps to retrieves multilingual password quickly. Despite this, it also consists some more useful features that make it unique. So, one can try this software to decrypts the complex and multilingual password of the locked MDB file. There are many MS Access users who are getting habitual to set multilingual and tough passwords to protect their MDB file. But, what if one can lost or forgotten password of Access Database?. With the help of this MDB database password unlocker tool, one can quickly recover following types of passwords. While users store their MDB database file. At times, MS Access facilitates an option to generate an Access backup database file. 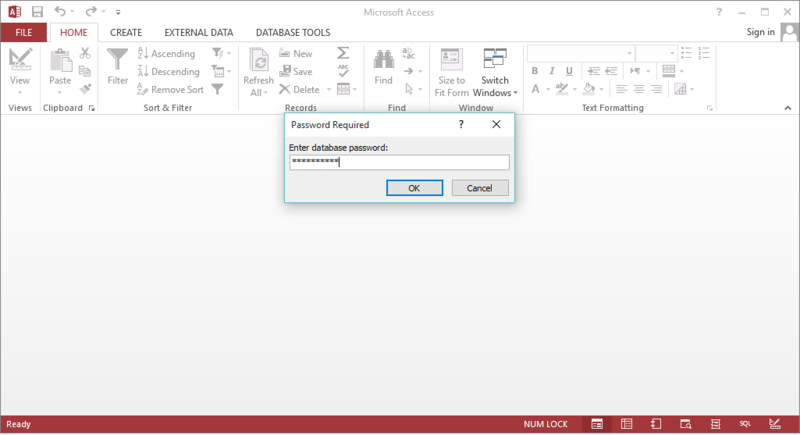 Though users also make this database password protected and when they lose their password, they started searching an instant way to recover forgotten MS Access password. In this circumstance, Access Database Password Recovery Software proves helpful, as it effectively removes password from protected MDB backup database. This Access Password Recovery software makes any password protected MDB file accessible. Mainly, you become enable to easily open password protected MDB database using this Access Password Unlocker tool. However, this tool helps to quickly recover lost or forgotten MS Access password. Hence, this software does not make any changes into the existing or assigned file password. This progressive MDB password recovery tool is programmed with an enhanced algorithm that easily decrypts the complex and multilingual password of the locked MDB file. Moreover, this Access password recovery tool is handy and at the same time, it also retrieves password composed of numbers and special characters or even numeric passwords. Moreover, using this tool, you can easily the recover access password in the original format. Once you browse the MDB file, the Access Database password recovery software scans it completely. Afterward, it will display all the details which involves information of Access database created in Access 95 or 97 and restored access database password of MDB Files. 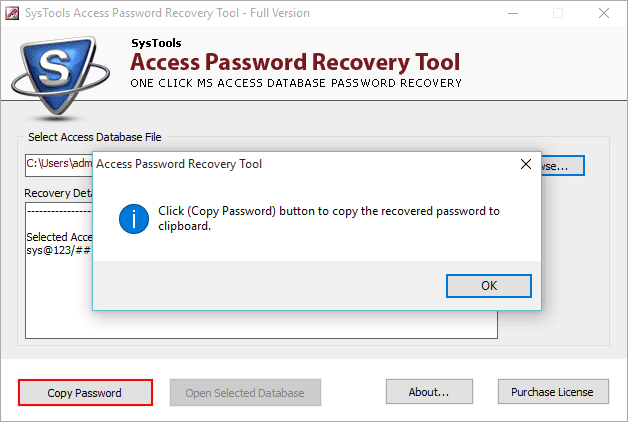 After successful recovery of the password, you just have to copy the recovered password using Copy Button and then open the respective document using recovered Microsoft Access Password. Using this MS Access password unlocker tool, you can effectively unlock the password protected MDB file without any compatibility issue. If in case, the forgotten password was created of alphanumeric characters, then also this MDB Password Recovery Software is capable enough to crack and reset the MDB database file password. The Access Password Recovery Tool is a true instance of user-friendliness due to its easy-to-use interface. Though, it has the options & commands to unlock MDB Password are incorporated on a single panel. This Access Password Remover Tool makes the recovery procedure easier and less technical for a geek user. Subsequently, you do not require to navigate or change the panel to recover access password this directly avoid the unnecessary confusion. The Access Password Recovery Software is programmed with efficient and enhanced algorithms to extract an MDB file password with a Brute-force Attack mechanism to try out every possible character combination. Alternatively, the complexity of the password does not affect the recovery time of the MS Access database password. MS Access also provides a facility to create a backup database file. So, often, users forgot the password they have generate previously to secure the MDB Backup File. Thus, in this situation, Access Database Password Recovery Software becomes an ultimate option to unlock Access MDB file. This tool has the capability to open protected Access backup database without any hassle. Access Password Recovery Tool is a Windows-based tool. Mainly, it supports MDB file created on MS Access 95, 97, Access 2000, Access 2002, Access 2003 and Access 2007 database password. This MDB password recovery tool has the ability to effectively remove or reset .mdb file password from any version of MS Access in three simple steps such as Browse >> Scan >> Copy Password. All in all, it extendedly supports all MS Access versions without encountering limitations. Free Demo Version of this Access (MDB) Password Recovery Software Recovers only the First 2 Characters in Passwords. 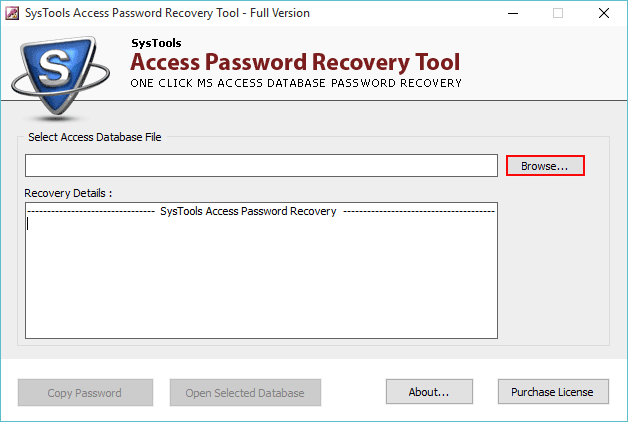 How to recover forgotten MS Access database password using this tool? Step 4: Select Open to unlock protected MDB file with an Access Password Cracker. Is the Access Password Unlocker tool helps to retrieve multilingual MDB passwords? Yes, this Access MDB database password recovery tool is programmed with enriched algorithms which facilitate an instant recovery of any type of critical password from MDB file within a few clicks. Does Access database password recovery software decrypt alphanumeric password of MDB file? The Access Password removeris equipped with enhanced features which makes it’s able to unlock the complex password i.e., created by the strong password generator. Whether the password is a coalition of alphabets, numbers or symbols. This software unlocks Access Database efficiently in spite of a complex password. Does this Access password remover is proficient to recover corrupted .mdb database files also? No, this tool only helps to remove or reset MDB database files only. 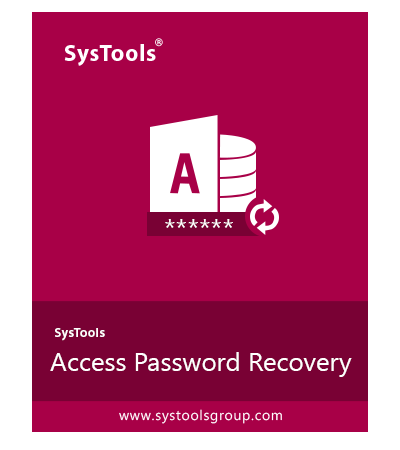 Just in case, if you need to recover your corrupted access database files then, you can go with SysTools Access Password Recovery tool. Does the Access Database installation is compulsory to open password protected MDB file? Yes, the Access password recovery software has necessarily required the installation of MS Access Database. When you installed access MDB password unlocker tool. Then, the application is easily removed MDB file password. If I remove or reset the access database password using this tool, is there chances to data loss? No, this Access password recovery tool only recovers lost MS Access password and doesn’t effect into .mdb database files. Can I use MS Access Database password recovery tool in Windows Vista? Yes, you can utilize this MS Access .mdb password recovery software in Windows Vista. Because this tool does not integrate with any kind of compatibility issues. It extendedly supports all versions of Windows OS such as Windows XP, Windows 7, Windows 8, Windows 10. Can I reset Access Database password for Mac OS based MDB database files? Yes, of course, using this eminent utility named Access Database password recovery software, you can quickly reset your password for Mac OS based .mdb database files. To do so, you just have to install access password recovery software in your local machine. Does this Access Password recovery tool recover old password of my .mdb database file? No, MDB password recovery toolonly recovers the updated password. And once you recover your password so, you can easily reset or remove access (.mdb) database password.